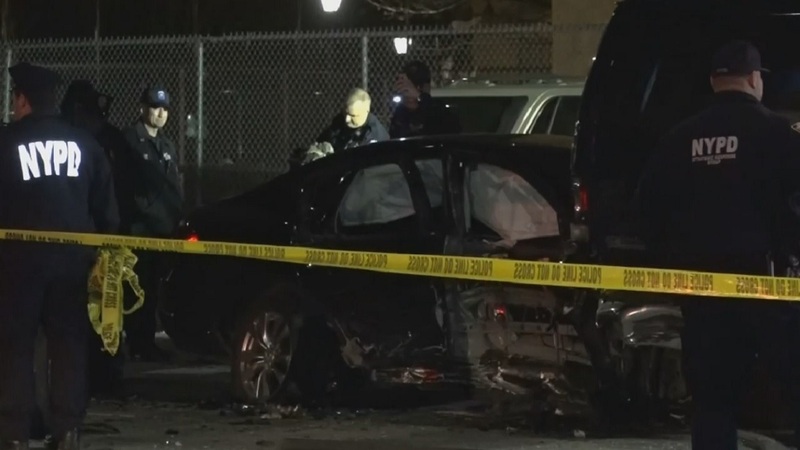 BROWNSVILLE, Brooklyn (WABC) -- Police have made an arrest after a crash in Brooklyn Saturday night that killed a rollerblader and injured five other people. 37-year-old Terrance Smith of Bedford Heights, Ohio is charged with DWAI and leaving the scene of an accident. The accident happened shortly after 8:30 p.m. at Pitkin Avenue and Powell Street in Brownsville. Police say a four-door 2012 Infiniti was traveling north on Powell Street at a high rate of speed, and struck a male crossing the street on roller blades at the corner of Powell Street and Glenmore Avenue. The driver of the sedan then kept going and struck two more vehicles. Officials say he continued to the intersection and hit two more vehicles, and two more parked cars. The driver of the sedan then jumped out of the car and fled on foot but was quickly apprehended in the vicinity of Junius Street and Pitkin Avenue. The man killed has been identified as 21-year-old Michael Joefield of Brooklyn.